The Nucleic Acids Method provides one-step easy analysis of dsDNA, ssDNA, RNA, and Oligonucleotides. In this method it is also possible to determine frequency of dye incorporation for dye conjugated nucleic acids. For each measurement the concentration calculated as well as the 260:230 and 260:280 purity ratios. In addition to a full scan graph, a full table with raw data points is provided. The Protein UV Method allows for protein quantification using direct A280 measurements. In this method is also possible to select from pre-programmed dye labels as well as create custom dye methods to determine degree of labeling of dye conjugated proteins. For each measurement results can be provided as an OD1 value or the concentration can be calculated based on the extinction coefficient for the selected protein at 280 nm. In addition to a full scan graph, a full table with raw data points is also provided. In the protein assays method it is possible to quantify proteins using colorimetric assays including the BCA, Bradford, Lowry, and Biuret assays. The Kinetics Methods allows for the measurement of change in absorbance as a function of time at fixed wavelength. Kinetic studies are routinely used for a variety of applications including the enzymatic determination of compounds in food, beverage and clinical laboratories. The change of absorbance per minute (A/min), concentration (A/min x factor) and correlation coefficient (calculated from a best fit of the data points) are displayed. The OD600 Method is used to determine the absorbance at 600 nm. Bacterial cell cultures are routinely grown until the absorbance at 600 nm (known as OD600; default setting) reaches approximately 0.4 prior to induction or harvesting. A linear relationship exists between cell number (density) and OD 600 up to approx. 0.6. The Wavelength Method allows for measurement of simple absorbance (Abs) or transmission (%T) at a single user defined wavelength. The results window shows the amount of light passed through the sample relative to the reference. The Wavescan Method records the absorption (Abs) or transmission (%T) spectrum for the range between two user defined wavelengths. The spectral plot allows simple identification of peak height and position. The curve interpretation of the entire spectrum provides most detailed information for a sample. The absorbance Ratio Method can be used to measure the ratio between two user defined wavelengths. The Concentration Method determines the concentration of samples from a single wavelength absorbance reading. The amount of light that has passed through a sample relative to a reference is multiplied by a factor to obtain the concentration. The factor may be a known figure, or may be calculated by the instrument by measuring a standard of known concentration. The Standard Curve Method can be utilized to generate a standard curve at a single user specified wavelength. 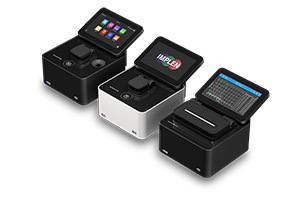 The preparation of a multi-point calibration curve from standards of known concentration to quantify unknown samples is a fundamental use of a spectrophotometer; the NanoPhotomer® has the advantage of being able to store this curve as a method to be recalled for future experiments. Fully customizable application development is possible with the proprietary NanoPhotometer® Operating System. Please contact Implen team for more information about custom app design to meet your individual application needs.